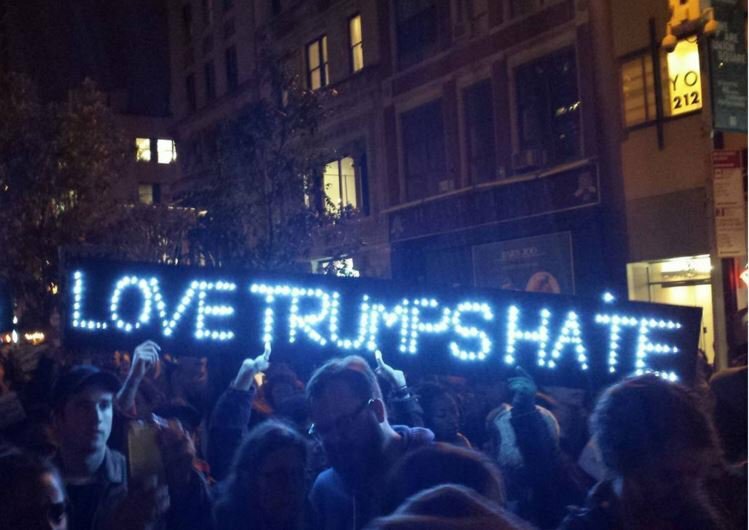 A protest against Trump at Union Square on November 9 2016. Credit: Waging Nonviolence/Eric Stoner. All rights reserved. What’s next? That's the big question facing the United States after the presidential election. And many people have been sharing their thoughts on that over social and traditional media, over dinner conversations, at the office and on the bus with complete strangers. And, as expected, people are all over the map with ideas and strategies. One developing theme is that we need to escalate—utilize more militant tactics in our resistance movements. Hatred, division and ignorance has escalated, so it is only natural that our response to it has to escalate along with it to match its intensity. While I certainly empathize with the emotions driving that idea, we also have to remember that it is violence that got us here. It is hatred, ignorance, division, intimidation—all manifestations of violence—that brought us Trump. In the most thorough study on the subject to date, Maria Stephan and Erica Chenoweth, an academic and author who started as a critic of nonviolence, found that nonviolent movements—even under the most repressive regimes—were statistically twice as effective as violent movements all over the world. They also found (looking at cases where the objective was secession of land or revolution) that movements able to mobilize 3.5 percent of the general population never fail in meeting their stated objective. Violence breeds patriarchy, which is at the root of so much of the violence in our society. Once you introduce violence to the equation, you limit those who can be on the front lines and those who can lead. Mostly, you limit it to young able-bodied men. And look where that has gotten us as a society. If we are not building a movement with leadership from the most disenfranchised—those who often can’t take up arms—we are fighting a never-ending losing battle. Stephan and Chenoweth’s work also shows that only nonviolent movements have been able to mobilize that magical 3.5 percent. We also know, however, that simply getting millions of people out into the streets by itself is not enough. If people think that nonviolence is only about getting millions to hold flowers and sing “Kumbaya,” they would be mistaken. Most people forget—or had no idea in the first place—how radical and militant Martin Luther King, Jr. was, and how aggressive a force nonviolence can be. King called for a movement that was just as attention-grabbing and disruptive as a riot. We need to find safe places to feel and release the anger and the fear, so that we can uncover—underneath all of that—an undying yearning for love and connection. That’s what needs to motivate us moving forward. Love can be sweet and sympathetic, but it can also be aggressive and assertive. It is that type of love that we need moving forward.